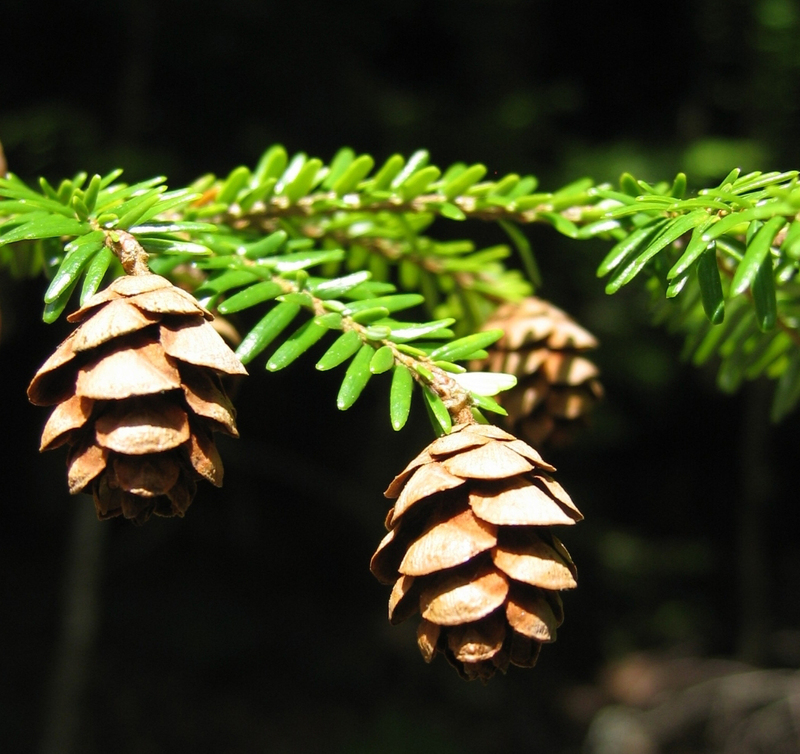 The eastern hemlock (Tsuga canadensis) is an important forest tree species in New England. While fairly ubiquitous in distribution across the landscape, shade-tolerant hemlocks excel in the darker habitats found on north-facing slopes, in ravines, and under deciduous canopies. As one of the key climax-forest tree species in the East, hemlock exerts a strong influence on coevolved lifeforms such as white-tailed deer (Odocoileus virginianus) and brook trout (Salvelinus fontinalis). These dependencies, however, may unravel as the Eastern Hemlock faces a threat unparalleled since it was locally-extirpated by the Wisconsin Glacier during the Pleistocene. 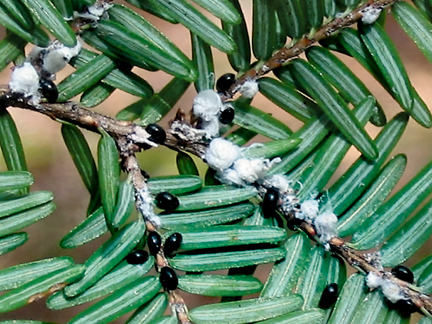 The hemlock woolly adelgid (Adelges tsugae) is a non-native insect parasite that has been slowly destroying the Eastern Hemlock population of the East since its arrival in the 1940s, when it was brought to the Mid-Atlantic by nurserymen. It was fairly uncommon until about 1985, when patch-scale hemlock decline first became apparent. 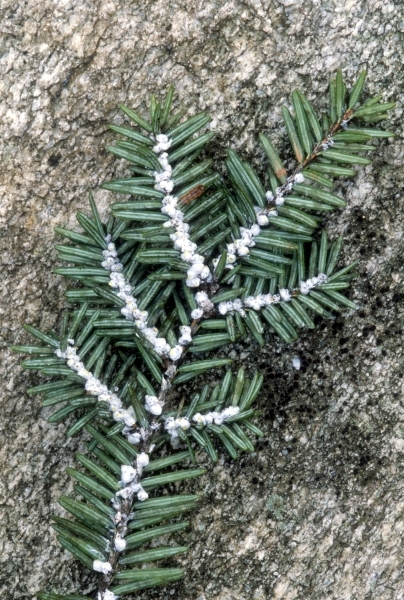 By 2000, almost all of the hemlock populations of coastal Connecticut were destroyed by the adelgid; several coastal land trusts closed their preserves due to hazards associated with falling timber. Over the next 10 years, the adelgid frontal wave spread up the New England coast and pushed inland. By 2017, mortality is especially dense in the Housatonic, Shepaug, and Naugatuck River valleys of NW CT where relatively warmer winter temperatures (related to the thermal inertia of water) facilitate the activity of the winter-active/summer-inactive stages of the adelgid’s life history. Cold winters (several days of below-zero temperatures) can reduce adelgid populations by 95%, but a couple of warm winters, as we are now experiencing, have allowed their populations to blossom. Two of the main concerns of forest epidemiology are the dispersal or spreading mechanism of the agent and the susceptibility of individual trees. While the adelgid’s sticky secretions facilitate their dispersal across the landscape by wind and by birds, deer, and mice, humans play a strong role especially when driving into uninfected areas from infected areas. In one case in Norfolk, CT, hemlocks in the driveway of a Southern Connecticut commuter were infested with adelgids whereas the remainder of the property remained unaffected. The offending branches (not the trees) were removed and the health of the surrounding forest was preserved for the immediate future. Many landowners have been talked into salvage logging their hemlock stands in the face of the adelgid, but there is virtually no science to support harvest as the best management practice for “forest health”. As a matter of fact, the most extensive infestations in NW CT have been found in logged sites where the opening of the canopy attracted the deer and bird vectors of the adelgid. Cross-contamination by logging equipment and the transport of infected logs has only exacerbated the problem by not only spreading the adelgid, but by facilitating the invasion of non-native plant species that excel in disturbed forest environments. The CT DEEP has failed to take any role in attenuating the problem. It is interesting to note that the adelgid is often not the actual final agent of mortality – it weakens hemlocks to the point that infections with secondary organisms cause their deaths. Such pests include the (exotic-invasive) elongate hemlock scale (Fiorinia externa), hemlock looper (Lambdina fiscellaria fiscellaria), spruce spider mite (Oligonychus ununguis), hemlock borer (Melanophila fulvogutta), root rot disease (Armillaria mellea), and needlerust (Melampsora parlowii), all of which exploit adelgid-weakened trees and accelerate the rate and extent of hemlock mortality. The adelgid kills its host by depleting the tree’s resource reserves in the xylem parenchyma and thus hemlocks growing in nutrient-poor locations, droughty upland/hilltop sites, or under a dense overstory will probably perish relatively quickly once infected. Contrariwise, it has been found that artificially fertilized hemlocks rapidly succumb because of their generous resource stores that serve to support large aggregations of the insect. Recent research has also suggested that hemlocks growing in exceptionally rich microsites are at higher risk. Therefore, fertilization is to be avoided in hemlock management. 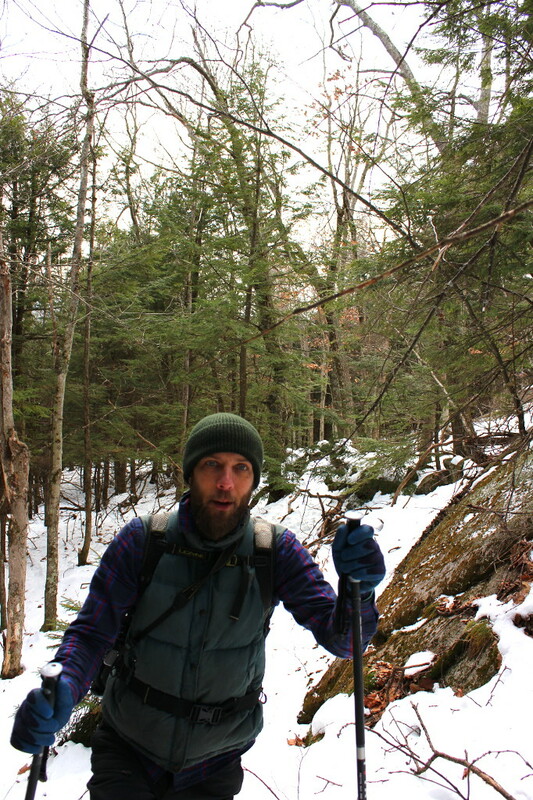 My beloved woods companion, Dave Emond, working in hemlock habitat on Little Monadnock, NH. In addition to biological controls, two systemic insecticides (imidacloprid and dinotefuran) are now registered and available for use in the forest environment in the form of root drenches. Caution must be exercised at these neonicotinoid insecticides have a significant impact on pollinators. They must not be used in any manner that makes them available to pollinators. When used judiciously, these insecticides can be and are currently being used to protect high-value hemlock forests. Land trusts can deploy these insecticides at the individual tree or grove level to salvage at least part of the hemlock population. I see this approach as particularly valuable in saving old growth trees and groves. Note that there are arboricultural solutions that can be used around the home. Root drenching is the most common and effective. Direct microinjection is a technique wherein adelgicide is injected into the conducting tissues of the trees; its success is highly dependent on operator proficiency and it is not recommended. Effective and relatively inexpensive inert horticultural oil with garlic supplements can be sprayed by hand or from boom trucks at six month to one year intervals. This approach suffocates the adelgid. All treatments are to be employed once the insect has arrived at your doorstep; there is no advance protective measure yet available. As a scientist and woodsman with a deep love of hemlocks, it is difficult to accept their fate. One hopes that the USFS will achieve a breakthrough, or that native predators appear (to exploit a new prey), or that there lies some genetic resistance somewhere in the hemlock population of the East. I am a big advocate of using imidacloprid and dinotefuran to protect hemlock groves in protected areas and dormant oils in landscaping settings. But if we ultimately lose them, the natural hardwood component of our regional woodlands will flourish if we allow the forest to naturally regenerate under the dying hemlocks. This is really the only way to prevent hemlock stands from becoming hot spots of invasive plants. From the perspective of the natural disturbance regime of our ecoregion, forest succession will convert the hemlock decline into expansion opportunities for many species. Cavity nesters and insectivorous birds will enjoy significant habitat enhancement as will many formerly-suppressed groundstory plants. 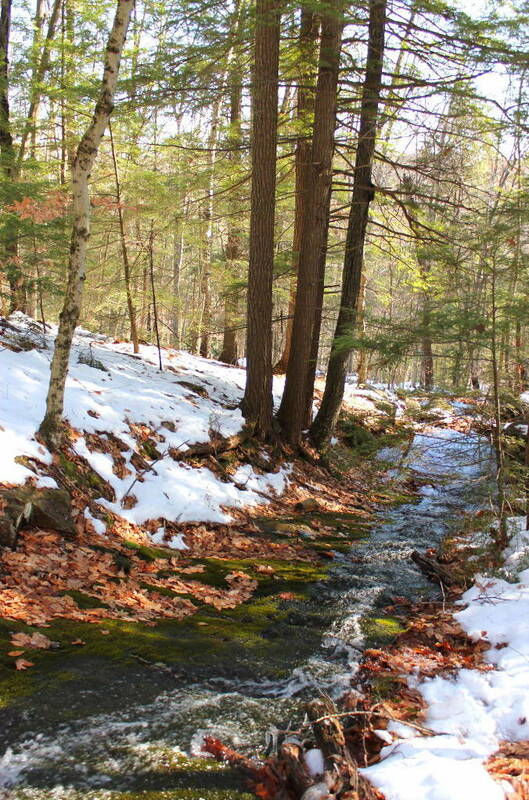 Already, black birch (Betula lenta) and sugar maple (Acer saccharum) are showing dramatic growth responses in southern Connecticut stands untouched by salvage logging. But we shall not give up. Hemlocks have faced epidemics in the past and returned to the current state without human intervention. Perhaps, with the help of science and preservationists, this will happen again. Water your hemlocks during times of drought. Don’t salvage log your hemlock stand. It’s OK to cut off an infected branch or two. Once the adelgid is detected on your property, contact an licensed arborist for advice and treatment. Consider the use of imidacloprid and dinotefuran root drenches in deployments that do not affect pollinators (typically a matter of timing). Consider getting the neighbors together to get a group price on drenching or horticultural oil spraying. Be aware of your potential role in infecting the hemlocks on your property and elsewhere via your travel habits. Next articleWhy Protect Land? A Running List For Recital Writers. Forest Patterns and Processes: An Introduction. We’ve had success using a basal treatment of imidacloprid and dinotefuran–it’s very easy to spray on the lower portion of the tree. We’ve treated hemlock groves at land trusts in North Salem and Lewisboro and Pound Ridge is following. The hope is that at least some can be saved so that when the adelgid somehow burns out these hemlocks will be left as seed trees. Nice. My main concern is about using neonicotinoids. I have seen some recent work on them that may calm that concern, but I have to dig deeper. We spray our hemlocks here at the house in Colebrook with dormant oil (Arbor Services of CT – Bill Pollock) and they are vibrant and healthy while the untreated hemlocks along Sandy Brook in the adjacent state forest are dying (mostly riparian mortality right now). My neighbor’s untreated hemlocks across the brook are falling onto my property and the banks are getting highly destabilized. Not pretty but disturbance is at least always interesting.